These goals establish the framework and form our key focus areas for improvement that will help make our vision and purpose a reality. They help to define what success will look like for our organisation, and we therefore also refer to them as critical success factors. Strategic objectives identify how we will deliver on these goals over a four year term – from 2016 to 2020 – breaking them down into achievable and measurable steps. They are the specific intentions that will lead us to achieve each goal. We have identified metrics for each activity to track how we are performing against each goal, and so we can recognise where we need to adjust our approaches or directions to achieve better results. The strategic objectives also help us in developing more detailed operation plans. We outline how we will deliver on each objective, and how we will measure success. We will regularly assess these focus areas and activities over the four year planning period so that they remain relevant and appropriate. We are committed to providing even more homes and support services to better serve our communities. We carefully manage company resources (such as finance and staff), to be able to successfully build on our successes. Our systems are agile and scalable, and we have processes in place so that we can continue to grow while maintaining existing levels of performance. The ability to grow and continually improve means we need to be driven by innovation; to be able to assess risk and benefits quickly and effectively; to and build on existing sources and develop new revenue streams; to continue to attract potential customers, partners, and investors; to create successful partnerships and access available funding; and to secure tenders and bids aligned to our investment strategy. Ensure our organisation is positioned to maximise industry funding or grants. Establish and grow a diverse portfolio of housing models/projects to meet clients’ needs. Source alternative funding and revenue streams. Increase revenue from non-Government sources by 4%. Strategic partnerships formed in line with governance framework for investment decisions. Pursue opportunities with Government and non-government organisations for housing projects. Undertake projects to increase housing portfolio within our risk and governance framework. Implement best practice asset management approach when planning portfolio growth. Be business ready for housing transfer opportunities. Actively participate in Government initiatives that provide additional social, affordable and disability housing within our risk framework. Develop a growth plan to serve the diverse range of clients in our communities. We live and work in a changing operating environment, with our sector and clients facing increased challenges. We therefore need to be agile – to match continually changing conditions and appropriately scale our operations; efficient – using our resources to maximum effect; and an employer of choice – attracting and retaining quality staff who share and contribute to our organisation’s vision and purpose. Enhancing our business practice requires much more than embedding a compliance approach where we meet, or even exceed, the requirements set by policies and regulations. It requires us to embrace a culture of innovation and focus on best practice and continual improvement. This approach means we will not only remain viable and relevant, but that we will be able to maximise our value and the impact of the services we provide. Continue to develop our people. Recognise and reward high performance. Be an employer of choice. Review and improve our approach to quality management’ consistent with ISO standards and methods. Enhance risk management approach and implementation. Meet best practice Quality and Risk Management standards. Manage costs to optimise outcomes. Optimise ICT to more effectively support business processes. Continuous improvement framework in place. Assess readiness for possible scenarios, undertake gap analysis, quantify risks and establish priorities to address systems, processes and people. Implement agile systems and processes responsive to change. Establish business transformation enablement program. Secure, affordable housing plays a critical role in improving the lives and well-being of vulnerable Australians. Evolve’s Journey Home® recognises that the journey to improved well-being and greater independence is different for each person. For some, providing stable, affordable housing improves their ability to engage with education, participate in training and employment opportunities and can assist residents in transitioning to greater level of financial independence, and reduced reliance on government assistance. For others, particularly people living with a significant disability, or older or frail people, transitioning from social housing into affordable or private rental may not be feasible. For those tenants, more appropriate goals might include gaining stability and skills to increase their social participation in their community; providing the skills to manage issues so they can maintain a tenancy; and/or improving their health and well-being. There is not one single response to building the capacity of residents, and assisting them to sustain their tenancies; but must include a range of initiatives. An essential element of Evolve’s role in this regard is to identify residents’ support needs and link them with appropriate support services before issues escalate. Our core service is to deliver quality housing, including tenancy and property services that best meet the needs of our residents. We will continue to monitor tenancy satisfaction levels and refine asset and tenancy management practices and policies to meet or exceed industry benchmarks. Evolve will continue to strengthen partnerships with support services to improve residents ability to maintain their tenancies and deliver programs and services that build capacity. Understand key issues and priorities for our residents. Further refine business practices, services and programs with residents’ needs. Ensure alignment between strategies, asset management framework and tenancy management approach. Implement best practice asset management and tenancy management approaches. Tenant satisfaction with tenancy and property management services. Evaluate residents ongoing support needs and align partnerships to deliver person-centred programs and services. Maintain a policy and service environment that supports tenancies. Implement programs that improve the ability of residents to maintain their tenancies. Increasing number of tenancies sustained. Deliver programs and services that improve the health and well-being of our residents. Assist residents in transitioning to greater levels of housing independence. Enhance systems and processes to measure and evaluate outcomes from support services provided. Services delivered build resident capacity. Anticipate, monitor and respond to relevant policy issues. Facilitate and participate in public dialogue relating to homelessness and housing stress. Develop and implement annual action plans to support stakeholder engagement, advocacy and, promotional strategies. Strong communities are socially inclusive, connected, resilient, just, and prosperous. Building the capacity of people and their material resources increases their potential to participate and contribute within their community and the economy. As well as providing safe, secure and affordable housing, there are other support services that increase residents’ capacity to engage with and contribute to the community. These include building life skills, improving health and wellbeing, education, financial management advice, and providing access to training and skills for employment in growth industries. using an evidence-based approach and outcomes measurement to determine which programs and initiatives have the greatest impact and best assist residents, so we can effectively prioritise our resources. We will build on our partnerships to access resources, capabilities, programs and/or funding to collectively achieve greater outcomes for individuals and the communities in which they live. Deliver evidence based, best practice social outcome framework. Evaluate the impact and value of our projects and services. Refine and prioritise initiatives to optimise use of resources and maximise outcomes. Identify opportunities and priorities for growth and improvement in the delivery of social value and outcomes. Deliver our social investment framework. Tailor our training, education and employment initiatives to meet resident needs. Partner to access and leverage government, business and community resources, programs or funding. Explore opportunities for social enterprise investment. Increase the number of residents engaged in community activities, study, training or employment. Create partnerships that bring needed resources and capability. Participate in joint projects to boost the delivery of social, affordable and disabled housing and associated services. Work with Government and Councils to deliver shared objectives/targets. Grow the amount of external resources used to deliver programs and projects. Build inclusive communities across household types, incomes and tenure. Apply best practice design to promote integration. Collaborate to leverage resources and deliver on shared objectives. Deliver programs and activities that build community cohesion. 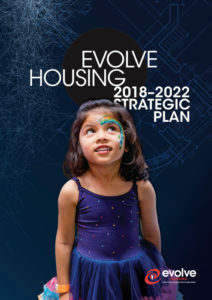 Evolve Housing is one of the largest community housing providers in Australia. We provide housing assistance to eligible people on low incomes or who are unable to access appropriate housing. Evolve Housing acknowledges the Traditional Custodians of our lands and pays respect to their Elders, past and present. Evolve Housing is an Accredited White Ribbon Workplace contributing to cultural change. We stand up, speak out and act to prevent and respond to violence against women.